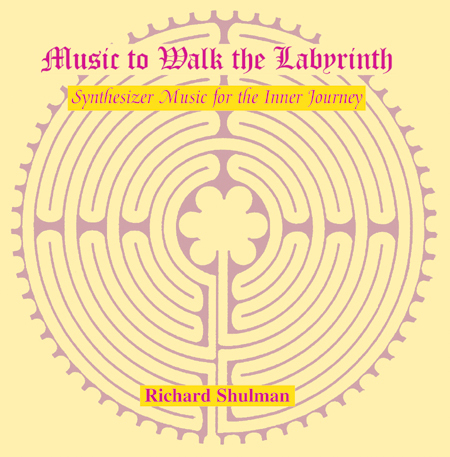 Music to Walk the Labyrinth: Synthesizer Music for the Inner Journey. This music was spontaneously composed and performed at a Labyrinth Walk sponsored by the Labyrinth Project of Connecticut, Inc. A labyrinth is a particular kind of maze with only one pathway leading to and from its center. There are no choices and you cannot get lost in it. Labyrinths offer an opportunity for walking meditation and can be seen as metaphors for life. Many find that walking a labyrinth helps them to enter into a natural meditative state. This walking meditation can be used for reflection and problem solving, as well as for spiritual and psychological growth. Music to Walk the Labyrinth is a continuous 47-minute synthesizer improvisation, created and performed specifically to enhance this experience. Composed, performed and recorded by Richard Shulman April 23, 1999 at the First Presbyterian Church of New Canaan, CT. Mastered by: Steven Smith at Soundsmiths Mastering, Asheville, NC. Do not drive while listening to this music. This music is best used for meditation. Dedicated to the Divine which makes Itself known through walking the Labyrinth. Ceremonial Labyrinth specifically for labyrinth weddings. The Labyrinth Project of Connecticut, Inc.